Property 4: Cottage 3 ears in the countryside 10 minutes A75 / 8 people. Property 20: Romantic 17th century village house with private spa, bakery and butcher within walking distance. Property 30: Character building on large wooded grounds with private garden. Property 31: Rural lodging chenes in a cardre of greenery and flowers. La Petite Truffe, Luxury Gite for two, Private Saltwater Pool, Perfect Getaway. Property 35: La Petite Truffe, Luxury Gite for two, Private Saltwater Pool, Perfect Getaway. 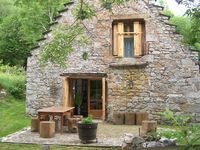 Property 50: L'Oliveraie: a cottage for 4 people, a cottage for two. 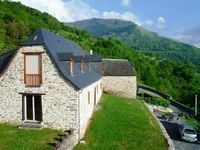 This cabin is situated in the perfect place to visit the Pyrenees and other attractions in the area, such as Lourdes. It is tastefully decorated, cozy and sits next to a stream. We were able to enjoy the beauty of the area and unwind from our crazy schedules. Thank you, Mr. Lavarini Michel for sharing your home with us! Loved this little apartment and how it was integrated into the original architecture of the building. It was well situated with sun in the afternoon and a good central access to different ski areas. We hope to go back!